A few months ago Tony revealed to me that he had never been sledding. On Dec 30, 2005 we made plans to rectify the situation by visiting Yosemite National Park. I have fond memories of sledding in Yosemite as a child. We didn’t quite manage to get on the road as early as planned, but still managed to make good time heading to the Sierras via 152 and 140. Once into the mountains (past Mariposa) Tony took over the driving, taking his first opportunity to try out the perfomance of his new Subaru Impreza. We entered the park along the Merced River and spent a few hours walking around Yosemite Village, getting lunch at the deli, and taking photos of Yosemite Falls and misc sights. 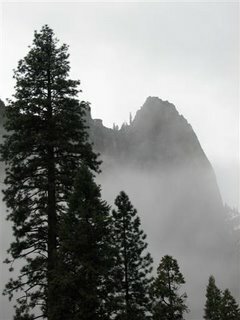 It was very misty and drizzly in the valley. It was difficult to see El Capitan and Half Dome . After lunch, we headed to Crane Flat to check out the snow situation. There were bare patches and no more than a few inches of snow, but it was just enough to sled in. We toted our sleds around the snowplay area for about 2 hours, finding various hills and helping out some other sledding newbies. A rest period sprawled on the snow turned into an impromptu 5 minute snowball fight from point blank range. We found a really good hill and spent some time honing our skills. It started raining around this point. We finally gave up, completely soaked from sledding in the downpour. This entry was posted in No Motorcycle Content, Outdoors. Bookmark the permalink.